For this manicure I used OPI Thanks a Windmillion, Sephora by OPI Leaf Him At The Altar and China Glaze Gussied Up Green. I finished the manicure with G & G HK Girl top coat. Tags China Glaze, O.P.I., Sephora by O.P.I. Today is the day nail community and nail bloggers want to honor and show their love for an amazing little girl that passed away, Talia Joy Castellano. 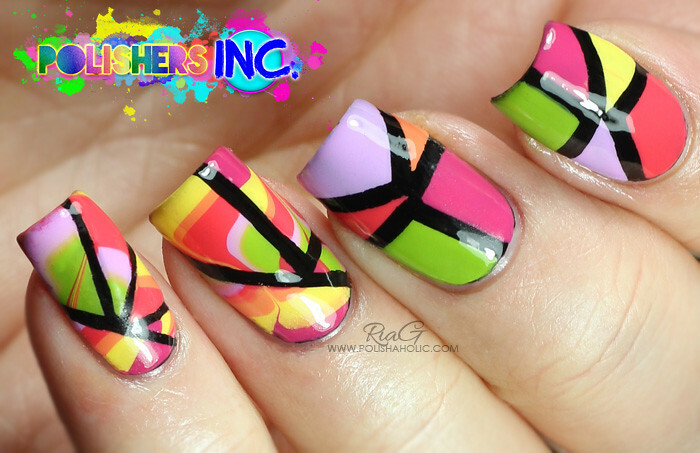 Thank you Nail Polish Wars for this lovely idea! Talia was a shining example of courage and strength. Despite of her long battle with cancer she was such a happy person and had an enormous amount of talent. Her videos and her legacy will live on. Here’s my mint mani for Talia Joy. I used China Glaze Keep Calm, Paint On and Color Club Angel Kiss with HK Girl top coat to create this look. I hope everyone is having a lovely Friday :) Weekend is almost here! 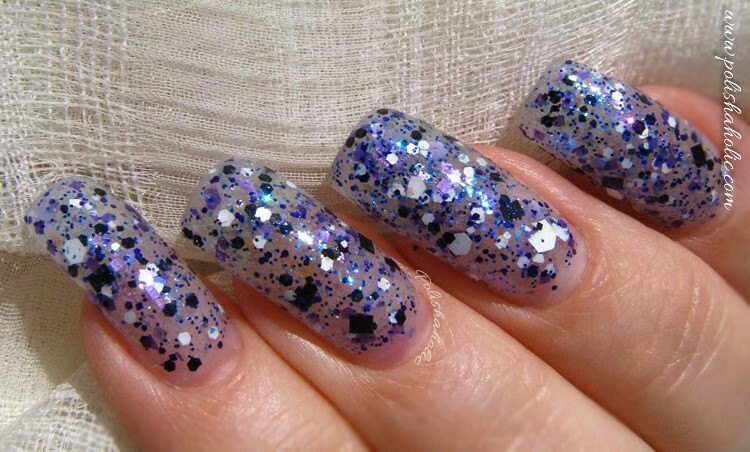 Today I have another Jindie Nails polish for you, Purple People Pleaser. After this I still have a couple of more to show you plus a re-visit to Barney Blew Up. My photos of that are on the short nails and I wasn’t too happy with those photos anyways. It’s also such a cute polish that it would be a crime not to use it! 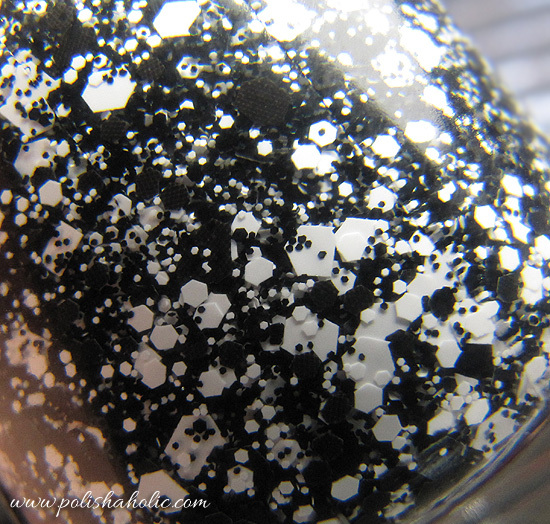 Purple People Pleaser is a sheer shimmer-y polish with a lot of blue, purple, white, black, etc. glitter in different shapes and sizes. This is at it’s best layered on top of a colored base. I also swatches this alone cos it can be worn that way too. 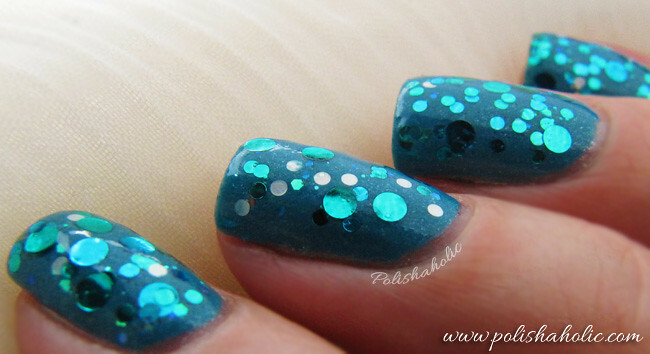 The cold blue shimmer on the base can also make your nails appear a bit more white too. 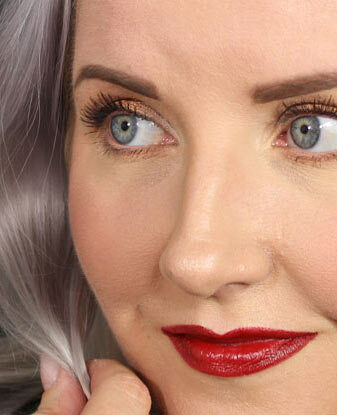 The formula is the usual normal indie glitter. Applies smooth and even. This is the usual, great Jindie Nails quality. On the first set of photos I have three coats of Purple People Pleaser, a coat of Nail Pattern Boldness Glitter Food and Inm Super Fast Drying top coat. On the next one I have layered a coat of Purple People Pleaser over two coats of OPI Pedal Faster Suzy! as an example. Then to my actual manicure and I loved the way this looked. The green base really made the purple glitter pop! Such a fresh looking combination. On that I used two coats of China Glaze Def Defying and one generous coat of Purple People Pleaser plus Inm Super Fast Drying top coat. Purple People Pleaser would also pair up perfectly with a gold base color. This applies so nicely that I think I’m gonna use this as a gradient glitter over gold sometime. You can purchase Jindie Nails polishes from their webstore that opens before next restock. You can also buy them from the Etsy-store (closed at the moment) as well as Llarowe, Mei Mei’s Signatures and Ninja Polish. You can find the latest restock and other info from their Facebook page. You can also follow Jindie Nails on Twitter and Instagram. 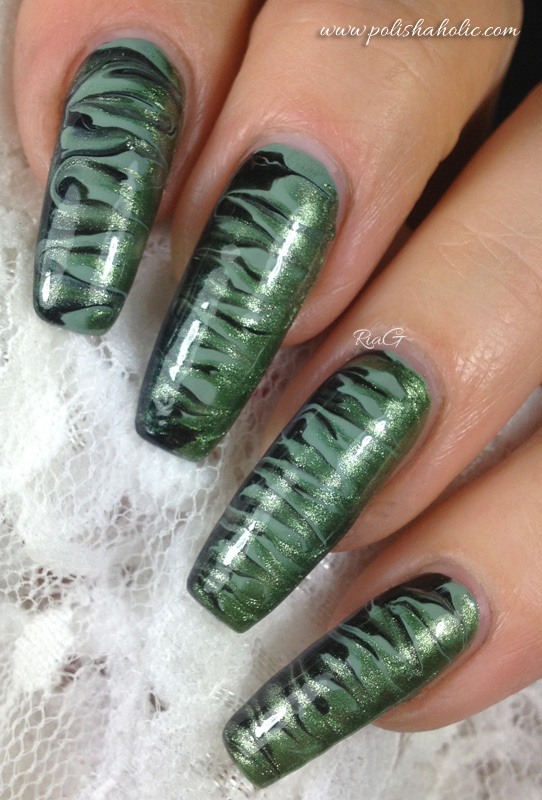 Jen has already given us a little taste of the upcoming spring collection on Jindie Nails FB and Instagram pages. I believe there is going to be more previews to look forward to today. Jindie Nails Purple People Pleaser, 3 coats, photo taken in sunlight. Jindie Nails Purple People Pleaser, one coat over OPI Pedal Faster Suzi!, photo with daylight bulbs. Jindie Nails Purple People Pleaser, one coat over China Glaze Def Defying, photo with daylight bulbs. Yay!! It’s time for our weekly ABC Challenge again and this week’s letter is C. For that I chose China Glaze Caribbean Blue with circle glitter. Enough C’s there for y’all? 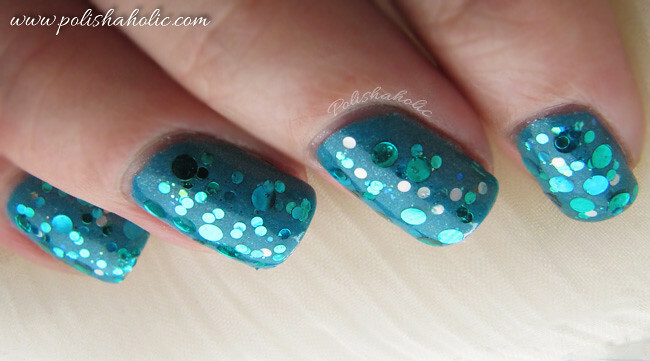 LOL Circle glitter awesomeness polish is Stay Behind, Catch a Wave from Elevation polish. I applied two coats of Caribbean Blue and one coat of Stay Behind, Catch a Wave. The circle glitter lays so flat that I only needed to use Inm Out The Door Super Fast Dry top coat to smooth it out. I’m totally in love with this circle glitter. Such a nice change from all the hex glitter I’ve had on my nails lately. 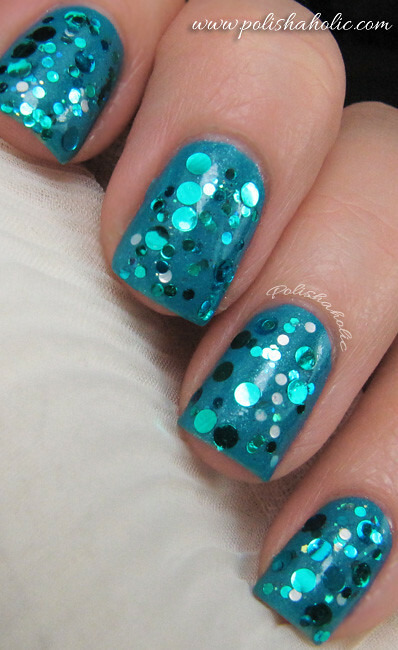 So sparkly and looks like raindrops on your nails. Stunning! Can’t wait to layer this with other colors too. Stay Behind, Catch a Wave can be bought from Elevation Polish store but it’s sold out at the moment. It’s Wednesday and time for our weekly ABC Challenge again. 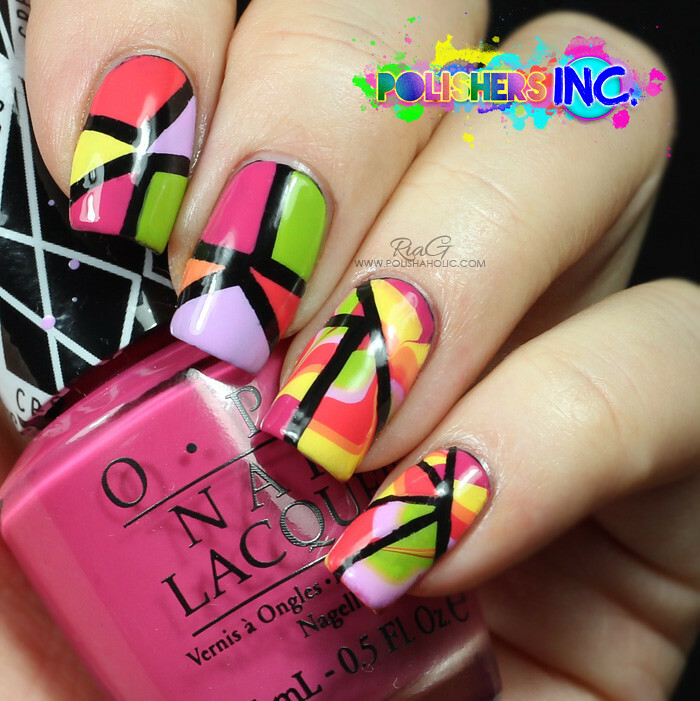 Here’s what I came up with for letter B: China Glaze Bermuda Breakaway with Color Club crackle Broken Tokens. I’m not a big fan of crackle polish and I think this is the first time ever for a crackle manicure on this blog. China Glaze Bermuda Breakaway is a beautiful ink-y blue creme from their Bahama Blues Winter 2008 collection. So I’ve had this polish for over 4 years now and it’s still as good as new. I believe this was two coats and it was fully opaque. 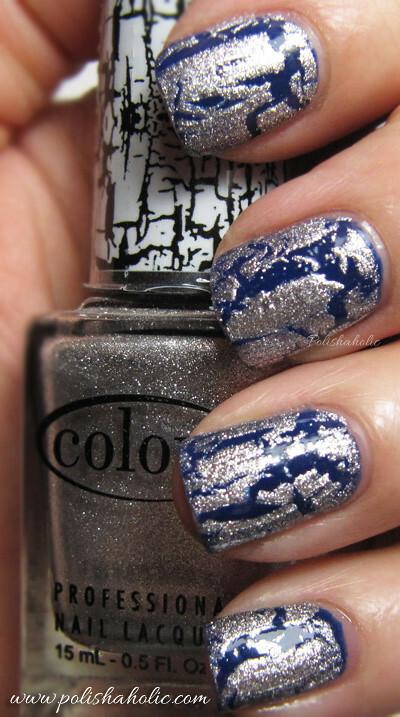 Color Club Broken Tokens is a silver foil crackle polish from their 2011 Fractured collection. Since I’m not a fan I only got this to test it out and cos it looked a lot prettier than many other crackle polishes out there. It’s definitely worth keeping and I might even use it again on some nail art manicures for special effect. This mani didn’t turn me into a big crackle fan but I still quite like how it turned out. The colors went well together and the crackle polish wasn’t applied too thickly.